A Diary: From my kitchen to yours. After a very hot summer this year, the season ended abruptly in Germany at the beginning of last month. When the summer is gone for good, it can get quite depressing, as the weather won’t get warmer or very sunny again until around April/May the next year. I have a thing in my kitchen, where I wait as long as I can until I cook with the first pumpkin of the season. Pumpkin to me, and I’m sure to everyone else, means autumn, and in turn accepting the fact that summer is completely GONE. I’m sure this odd thing of mine isn’t so comprehensible for most people who haven’t experienced the cold and dark winters of Germany. But I can assure you, it’s no fun at all. Waking up in the dark even if you wake up around 8am-ish, grey skies, sunset (if there’s sun that is) at 4:30pm-ish, and the freezing temperature almost everyday can be extremely gloomy at times. I’m sorry I’m whinging. There are though, plus sides to the long dark winters. Christmas is around the corner (=over-indulgence in food and wine! ), sipping piping hot Glühwein (Mulled wine) in freezing weather at the Christmas market with friends, standing tightly huddled around a small table, and a lot of use of the oven in the kitchen to keep the apartment warmer. Two of my favourite produce come in season as well. Pumpkin as I have mentioned, and kale are in abundance at the farmer’s market. I bought a medium sized, yellow-fleshed pumpkin at the market last week. I can’t remember what sort it was unfortunately. And although kale doesn’t come in season until November in Germany, I found fresh local spinach at the Demeter stand, and hence this pasta was born last weekend. This pasta dish is super easy to make. The most time consuming part is cutting the pumpkin into cubes, but otherwise there isn’t much chopping involved. The timing can be kind of essential though, as is with most pasta dishes. I recommend butternut squash or other creamy variety. I do not recommend Hokkaido pumpkin, as I find it quite tasteless and the texture is somewhat mealy compared to the Butternut. I still don’t understand why the supermarkets here stock so many of these, and not Acorn, Delicata, or Kabocha. Anyways, back to the recipe. The cubed pumpkin is tossed in olive oil and roasted with garlic, thyme, and rosemary, which will make your kitchen smell divine. In meanwhile, wash the spinach and chop roughly (or just use the kitchen scissors while the spinach is still in the drainer like I did). The pasta should go in the boiling water right after the pumpkin is out of the oven. While the pasta is cooking, heat up the oil in a pan and toss around the roasted garlic for 30 seconds or so, then add the spinach, and then the pumpkin and plump sultanas to mingle the flavour. 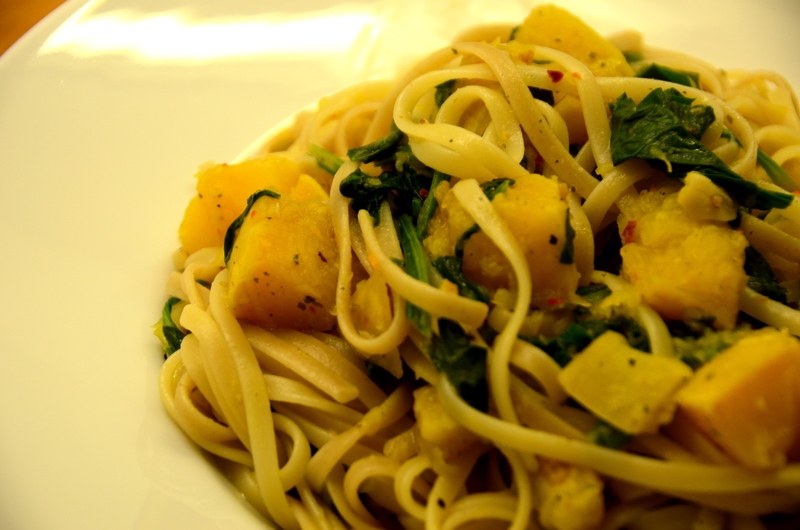 By then, your pasta should be cooked, and all you need to do is carefully toss the pasta with a bit of the pasta water as not to squash the pumpkin cubes into a pulp. Voilà! Dinner is ready! Happy cooking everyone! 200-230g Linguine, depending on how hungry you are. 1. Turn the oven on to 200 degrees Celcius. Trim the pumpkin and cut into bite-sized cubes. 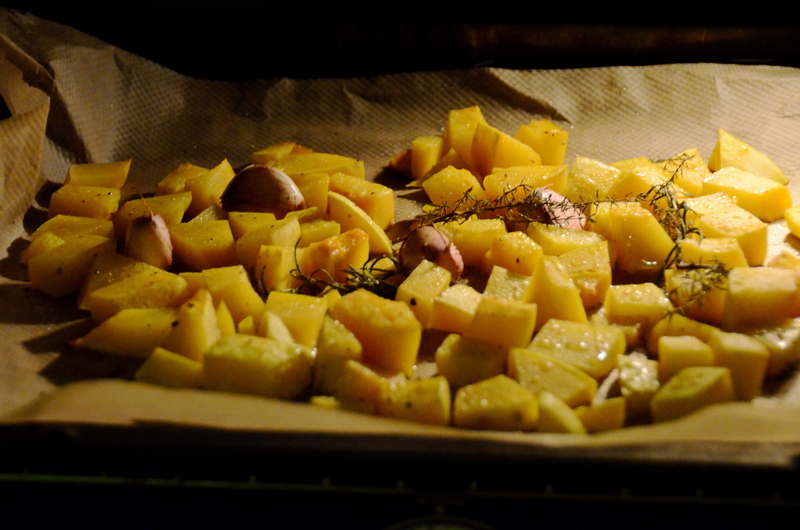 Lay the pumpkin cubes, garlic, and the herbs on a baking paper and baking tin, and coat with a tablespoon of olive oil,. Season with salt and pepper. Depending on the size of your cubed pumpkin, it will take around 20-30 minutes. Mine took 20. Stir half way through. 2. Soak the sultanas in boiling water to plump up. 3. Depending on how fast your stove is, bring the pasta water to boil just before the pumpkin comes out of the oven. Set aside with the lid on. 5. Heat the remaining tablespoon of olive oil in a large frying pan in a medium-high heat. Squeeze the garlic flesh out of the skin and add to the pan. Stir around for 30 seconds. Add the chopped spinach and cook until wilted. 6. Add the pumpkin and the drained sultanas. Toss around the pan to mingle the flavour. Sprinkle with chili flakes if you like. 7. At this point, your pasta should be cooked to al dante. Save half a cup of cooking water, then drain the pasta. Add the pasta immediately into the frying pan and toss around with a tongs gently, adding the pasta water as necessary, if the dish seems dry. 8. 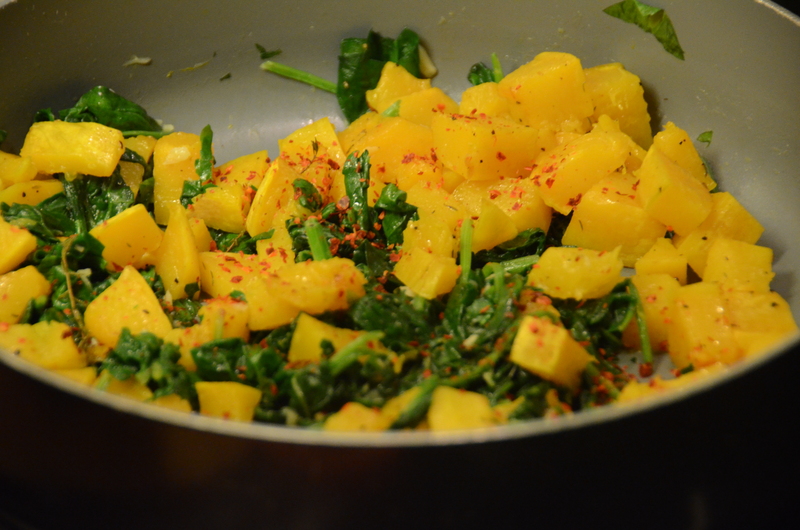 Serve with a small drizzle of pumpkin seed oil or olive oil on top. Sprinkle with Parmagiano reggiano. Of course! get your mum to help! Be careful when you cut the pumpkin! Xo.